Marketing a car is tough. You don’t just necessarily toss a coin to figure out its specs or price. It takes careful study, considering things like how your brand and vehicle is positioned and how it sits in the market next to its competitors. In short, you have to make it competitive enough so that when a new offering comes along, you won’t find yourself pummeled. This is what I don’t understand with the Tucson. 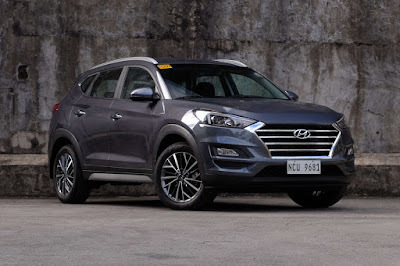 Instead of making itself viable until its next full model change, all it took was 4 months (the 2019 Tucson was officially launched in October last year). See for this model year, the Tucson gets mostly cosmetic changes to bring it closer, style-wise to the rest of the Hyundai SUV family. And it’s a great effort too. Without a side-by-side comparison, the differences look minor, but parking the 2019 beside a 2018 one reveals a wealth of changes, particularly to the front. 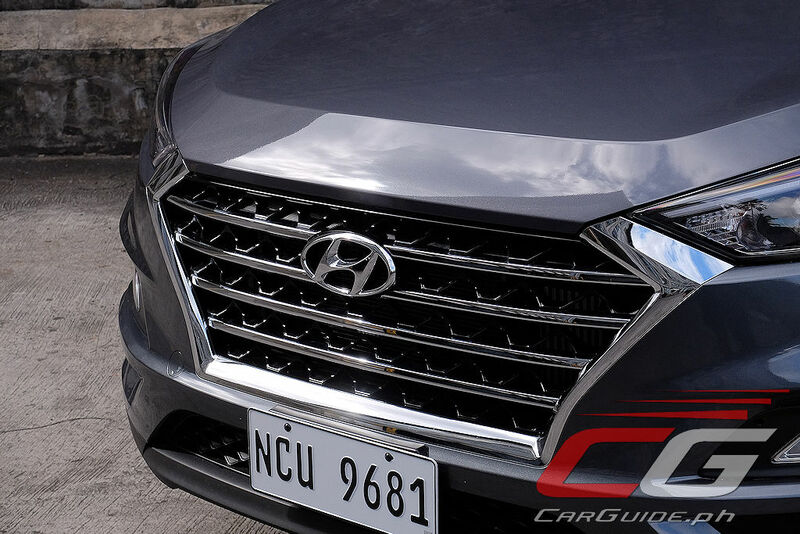 Now, it creates a stronger, more lasting impact because of that larger grille. 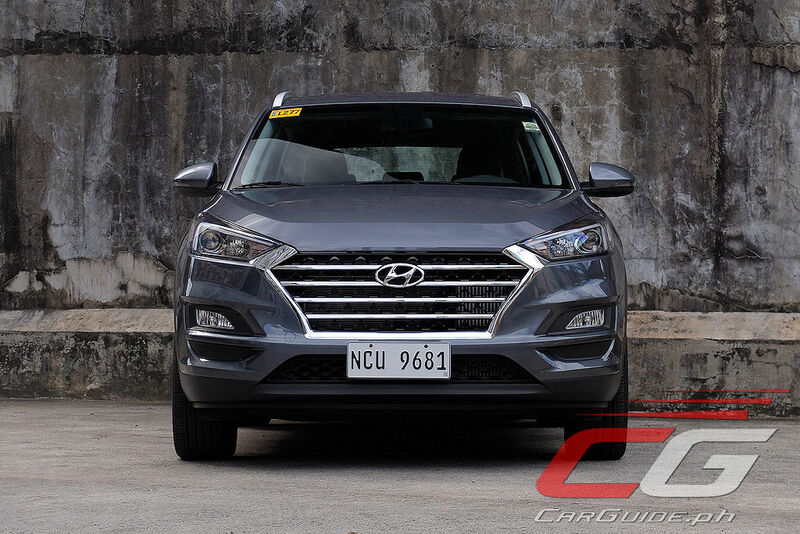 Shaped to resemble the cascading design seen on the Kona and Santa Fe, it, of course, necessitated changes to the headlights and bumpers as well. The rear gets some changes too, but they’re limited to just a new pattern for the taillight and the repositioning of the reflectors. Okay, so far so good. But then you switch on your headlights and they glow incandescently; you think, are these halogens? Unfortunately, yes. 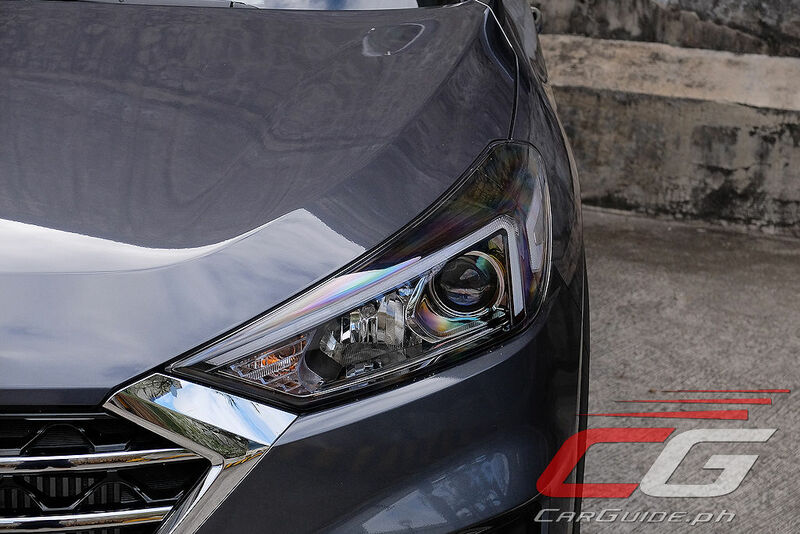 This may be a P 1.835-million crossover, but halogen headlights are the only thing you’ll get. It’s a rude awakening for sure, and it’s a sensation you’ll have to get used to as you step inside. This may be the top-of-the-line variant, but you don’t get leather seats. Yes, the thrones are covered in plush and well-wearing fabric, but they’re still fabric. 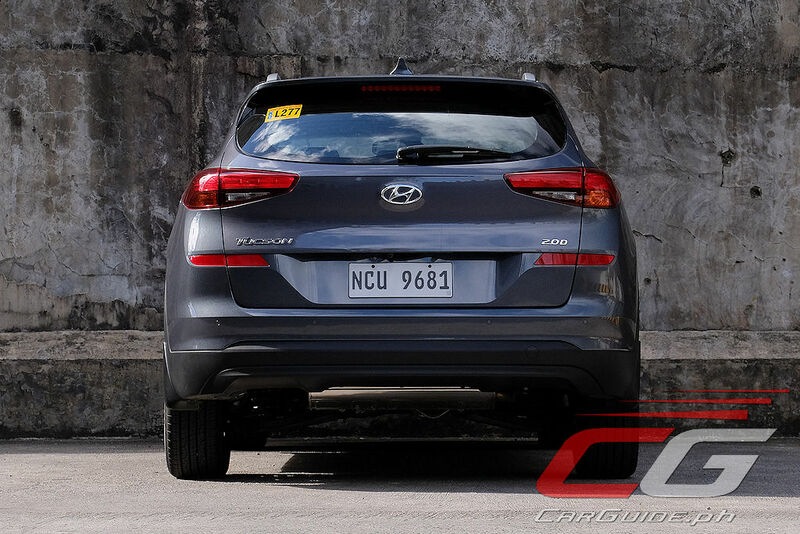 It’s the same sort of material that won’t look or feel out of place in the Kona, but remember, that crossover costs close to 700,000 pesos cheaper. 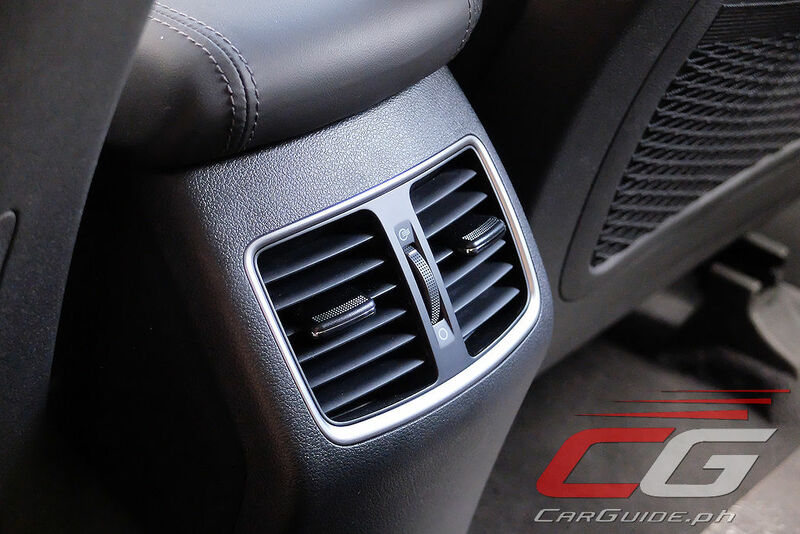 It’s even odder that besides the non-cowhide seats, the Tucson gets a powered driver’s seat and rear A/C vents (the climate control’s manual though). 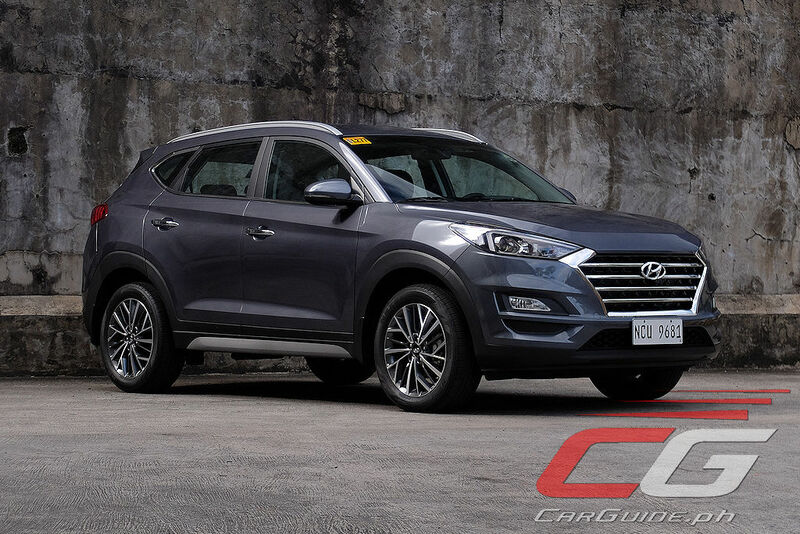 Hyundai’s decision feels more a move to get a PETA seal of approval and that single omission muddles what could have been an otherwise well-executed cabin. 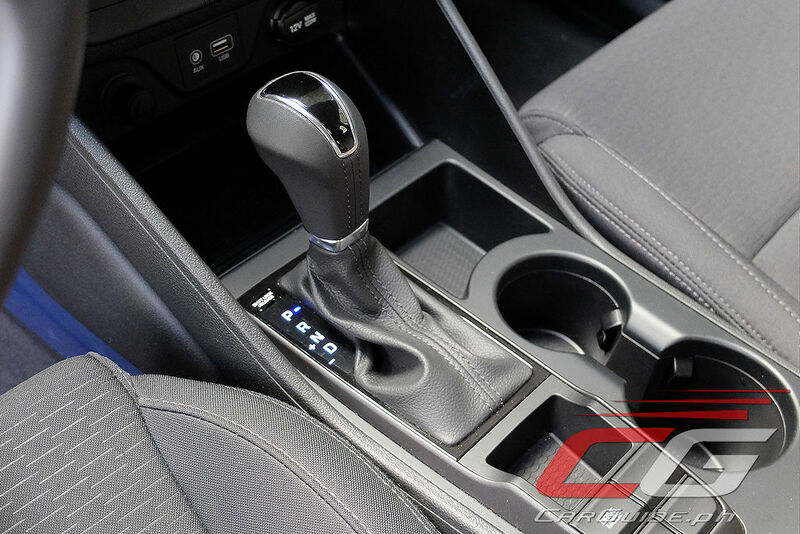 The cabin plastics (complete with some faux carbon fiber) feel at par with its competitors and the controls—from the instrument cluster, steering wheel, shifter, and stalks are some of the best in the business. 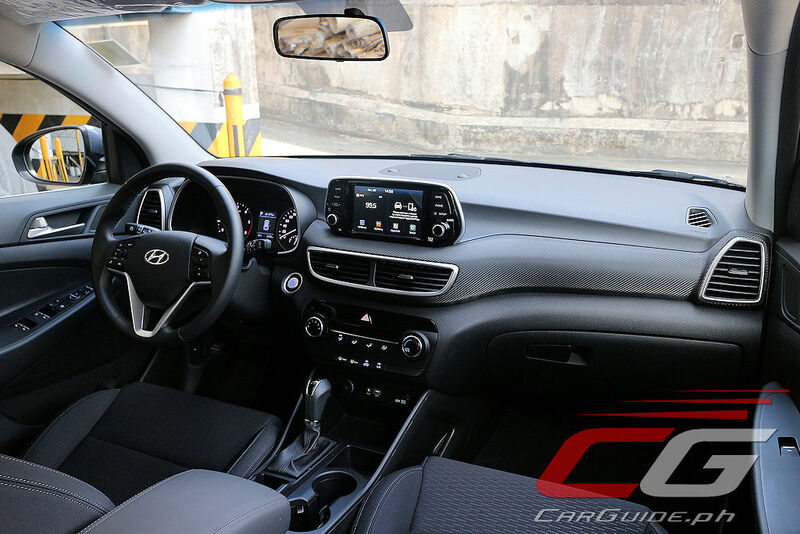 Oh, and this year, the Tucson finally enters the modern era with its infotainment system. It’s the same floating one seen in the Santa Fe and measuring in at 7 inches in size, it’s crisp, responsive, and full-featured. 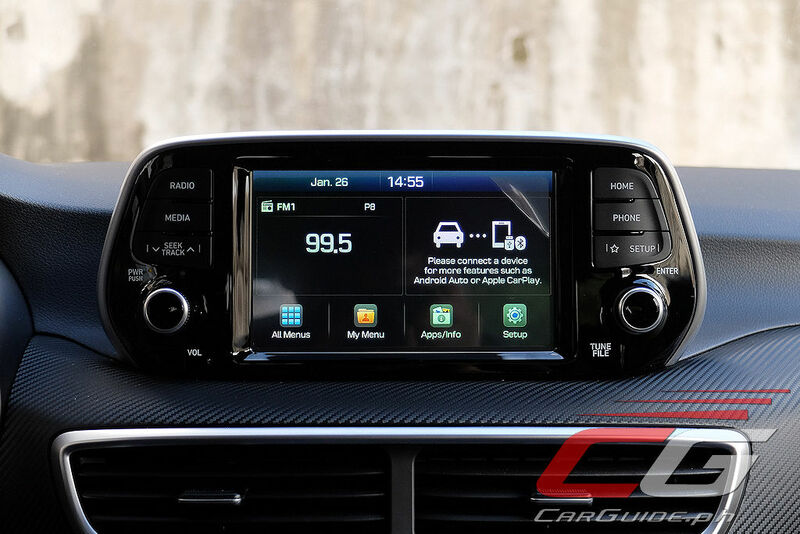 Not only are the text and graphics easy to read and the menus, intuitive, but it finally brings Apple CarPlay and Android Auto to the Tucson. It also serves as the monitor to the backup camera as well—a better placement compared to the previous rearview mirror-mounted one. 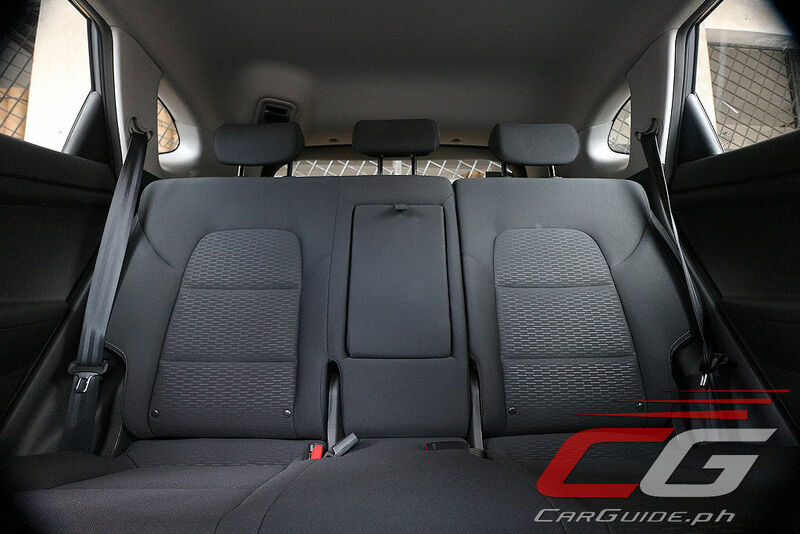 Shame about the lackluster interior, because the Tucson still manages to conduct itself nicely on the road. 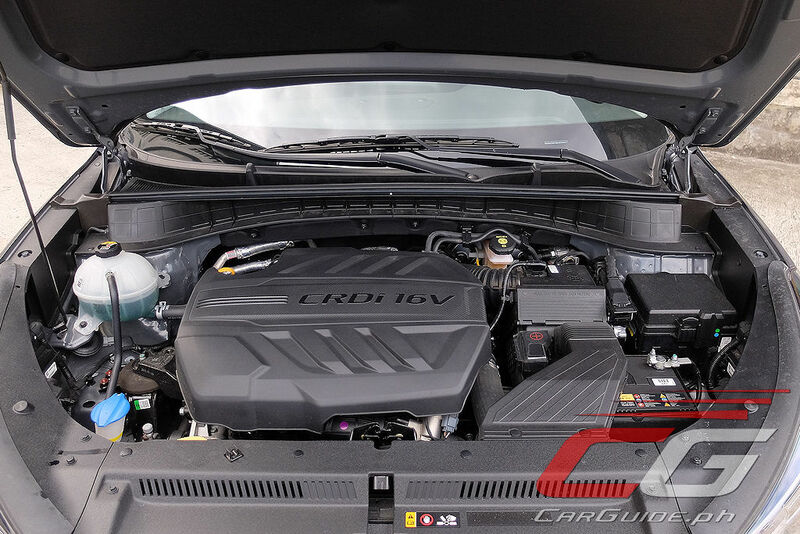 The 2.0-liter R CRDi VGT engine is still close to unbeatable thanks to its 185 horsepower, 402 Nm of torque figures. For 2019, it’s much quieter and more refined perhaps because of the new gearbox that has two more forward gears. As always, there’s an endless surge of power available and this time, there’s no more momentary lapse thanks to a gear ratio that’s more spread out. 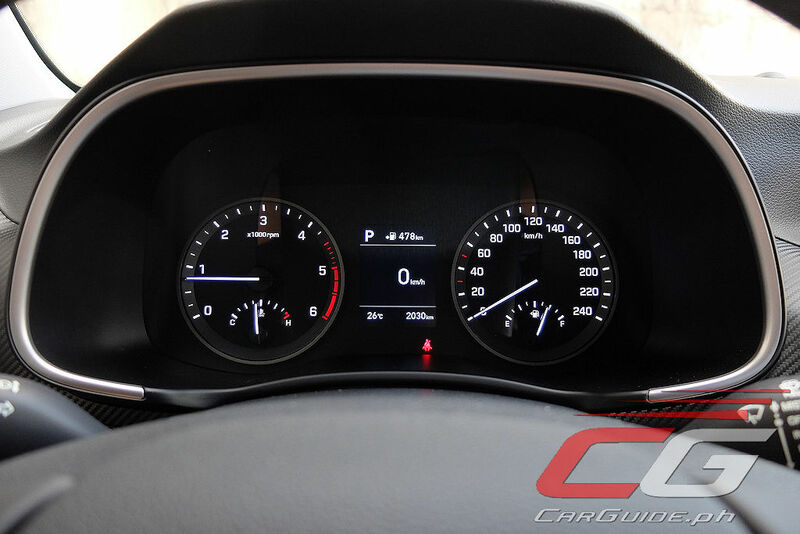 With that, the engine feels more relaxed and refined. There are still no paddle shifters, but they’re not needed. What’s more, fuel economy has actually gone up at least 5 percent compared to the last time I drove a Tucson. It now sits at 10.20 km/L at the worse and 14.7 km/L in the lightest traffic. 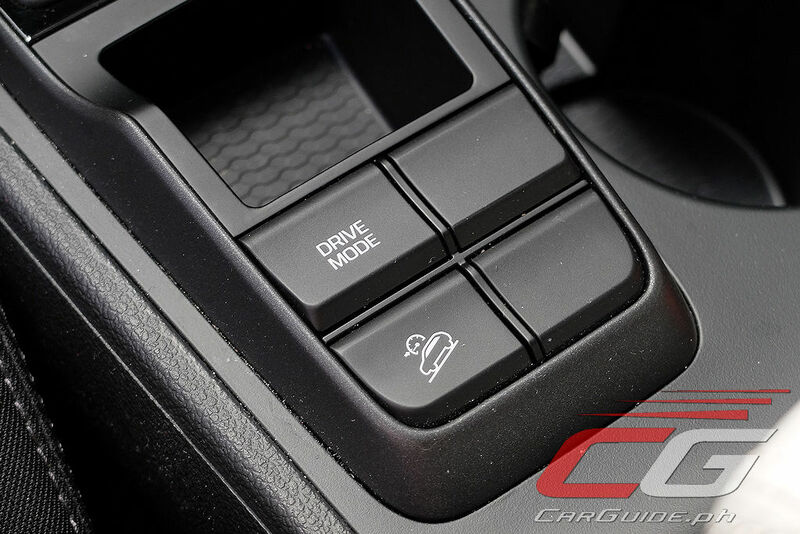 For 2019, Hyundai has thrown out the gimmicky Flex Steer system and instead put in Drive Modes. 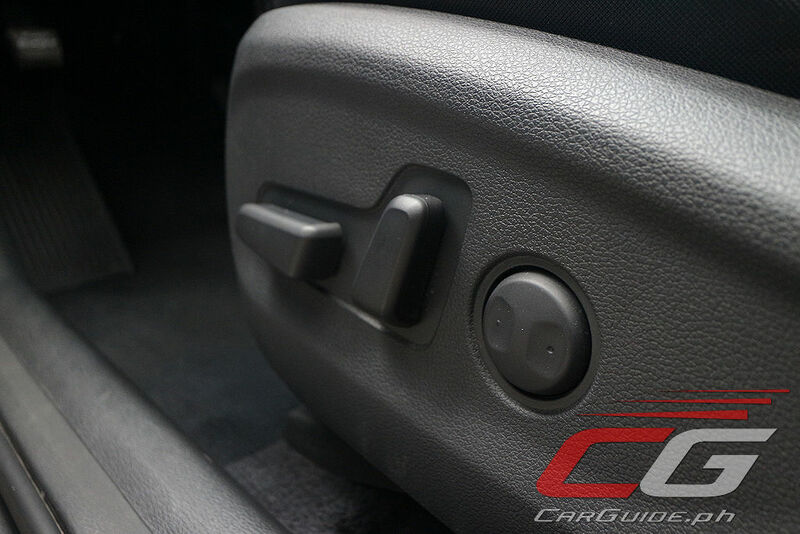 Not only does this control the steering effort, but it matches that by tweaking throttle and transmission characteristics as well. Whatever the setting though, the Tucson doesn’t manage to end up being all-out sporty. Rather, it sits closer on the comfort side which should appeal to a wider set of buyers. At least, the steering is obedient, and the suspension planted. In 2016, Hyundai laid out a solid foundation when it launched the then-all-new Tucson. A year later, they’ve sought to go premium in their pricing and the new-found features justified that. This year though, you’re wondering well of that went. In spite of an even higher pricing (it’s up by close to P 300,000), the stuff that was standard in this, the top-dog GLS CRDi 2WD are MIA now. In this day and age, a premium-priced compact crossover demands to have premium level features. 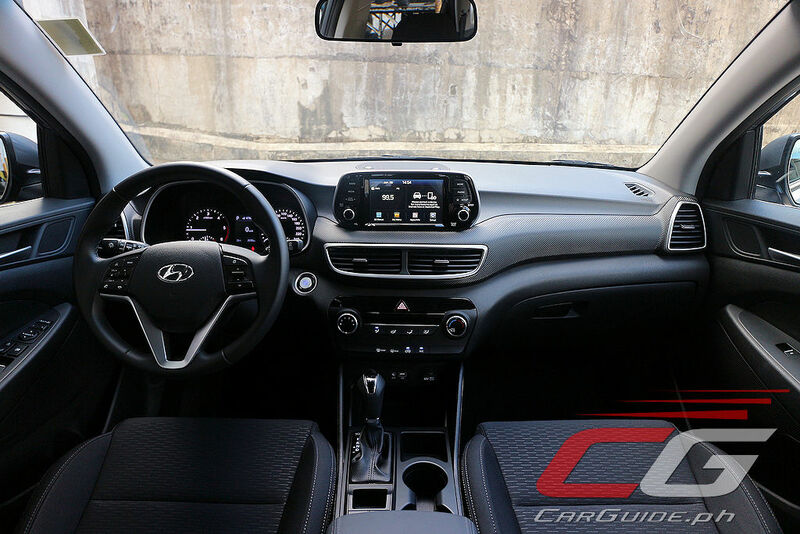 While Hyundai has finally given us an infotainment system worth rallying behind for, the deletion of the leather seats is a very visible reminder of something very, very wrong. 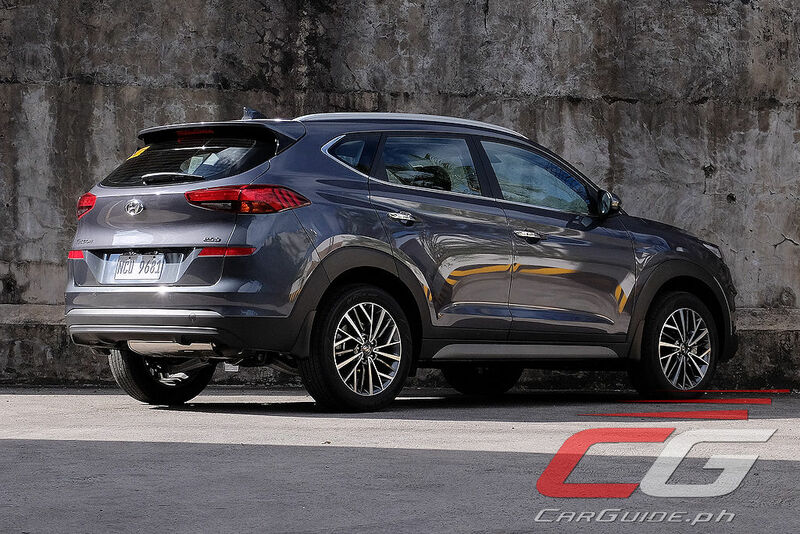 There are Japanese crossovers that are better value now and even the revitalized Kia Sportage—which is mechanically the same as the Tucson offers much more at a lower price. 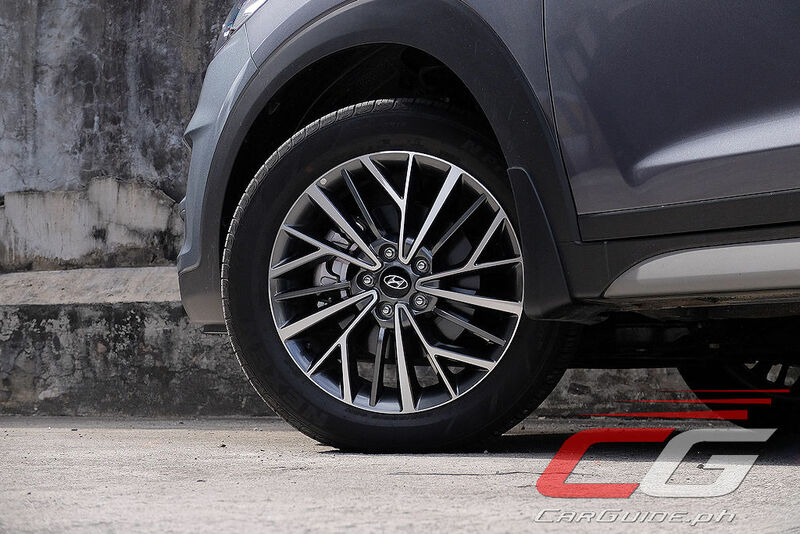 It’s hard to understand what’s at play here given all other compact crossovers have been offering better equipment for either the same or a lower price. It’s as if Hyundai’s been trying to hang onto that diesel engine calling it a worthy reason to justify that purchase price. Well, here’s a very short answer for you: it’s not. 300k price increase without much new features is really abusive. 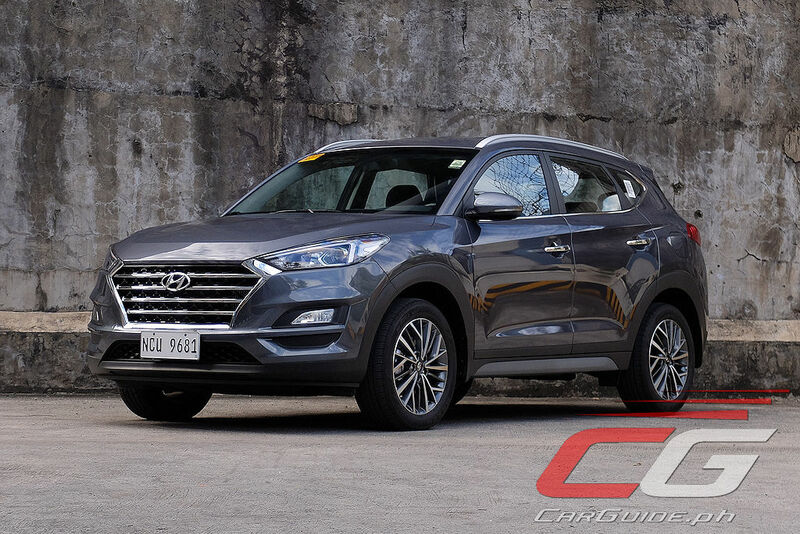 If you really dig the Tucson, the 2018 model is still available at some dealers at a steep discount compared to this. Yup, agree on this one. And to add that in my opinion the older design was better looking than this new facelifted model. You gotta symphatize with Hyundai, they build their cars in their 1st-world home country, with strong unions and highly-paid workers, to 1st-world materials & build quality standards, with world-class & eye-pleasing designs and superior specs, only to feel the need to cut it down specs-wise when exporting it to 3rd-world countries like ours because, unlike the Jap & US brands, their cars can't benefit from lower import taxes & duties due to the ASEAN Free Trade Agreement & JPEPA. That is the root cause of why in recent years, their vehicles cannot compete in prices & specs with their direct competitors. 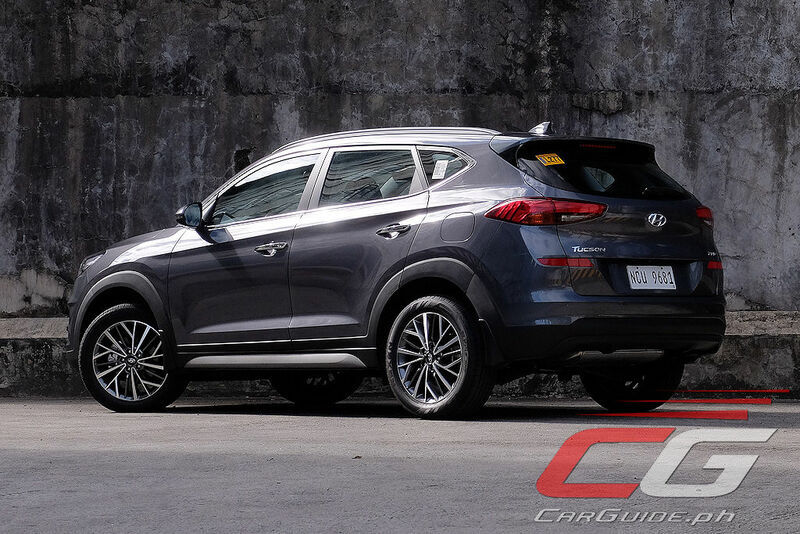 Hyundai PH had no choice but to cut down the specs to lower the price against their 3rd-world built competitors. I really like the current-gen Tucson, even the pre-facelift version IMHO looked better than the best-looking Japanese compact crossover, the Mazda CX-5. Powertrain-wise it was and still is the best in its class. It just can't compete price-wise locally unless Hyundai decides to build it in some 3rd-world factory paying 3rd-world minimum wage like their Jap & US brand competitors have been doing to take advantage of AFTA & JPEPA. To be fair to Hyundai, they have produced high quality products in recent years. The problem with the Philippine models is the distributor. HARI is obviously geared towards maximizing profits out of every Hyundai product they churn out in the Philippine market. Their main argument is their diesel engines, and I agree with the author that this is a weak one. When you look at the competition and automotive universe in general, there are a lot of better options at this price point. It's just to expensive for what the car brings to the table. More like buying first class airline tickets and getting an economy seat. Nope, like what I said above, it's simply because of added import taxes & duties since these are all 100% CBU made in South Korea, unlike their Japanese & US competitors who build theirs in countries that benefit from no import taxes & duties due to AFTA & JPEPA. Tsk tsk tsk. HARI killed a good product again and again.